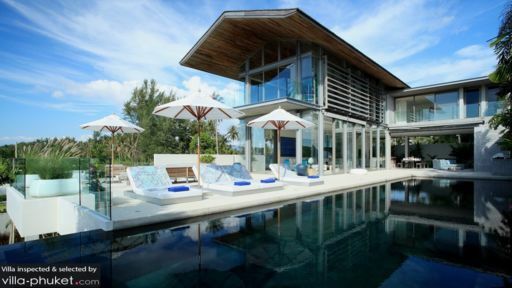 Found close to Phuket’s Natai beach, Villa Aqua is a four-bedroom tropical paradise with an 18-metre infinity swimming pool, contemporary interiors and exteriors, as well as a tranquil and calming ambiance to rest your mind, body, and soul. The villa features glass walls across its many spaces to maximize on the remarkable view and to ensure you get ample natural light during the day. Most importantly, the ‘Aqua Spa’ is where you can indulge in massages and therapies for a relaxing and refreshing time! The four master suites at Villa Aqua are found on the upper-floor and while one of them faces the ocean, another one opens out to a private balcony from where you can get an enviable view of the area. The bedrooms all have floor-to-ceiling glass walls so you can take in the view from your comfy double beds as well! The hardwood floors, simple and bold color schemes, and an opulent vibe all make the bedrooms a haven for the tired souls. Each bedroom has an en-suite bathroom, of which have walk-in showers or bathtubs. The stunning outdoors at Villa Aqua celebrates island-style living with an infinity swimming pool, lush tropical vegetation, and a comfortable lounging area. Rest up to your heart’s content as you lay back on the comfy deck chairs found beside the pool, swim laps or splash around, enjoy the sunset, and kick back with a freshly-brewed drink for the most amazing time! There are parasols to shield you from the sun, so you can even take a nap. There is a lounge area with plush couches, chairs, and tables to make for a nice, little spot where everyone can gather around to enjoy the natural surroundings. A barbecue pit is accessible for a fun garden party. Serene is the word that describes the stunning living spaces at Villa Aqua as it encompasses pastel blue hues and white interiors to create a sanctuary for guests to relax in. There is vibrant artwork on the walls to strike a balance with the all-white interiors. Another TV lounge features a wall-mounted, flat-screen TV, and powder blue lounge chairs. The glass enclosure makes sure you can relish the scenic beauty of the outdoors as you lie back on the sofas and enjoy a peaceful moment or two. A smaller area is similar to a work room, and is furnished with a desk, sofas, and chairs. The dining area is adjoined to the living area and features a lavish bench-style dining table to accommodate guests comfortably. Whichever direction you turn in, a bright spot of green and blue will greet your eyes as there is ample foliage growing all around the villa’s periphery. The fully-equipped, open kitchen is where you can master your culinary skills, or even request the house chef to prepare delicious meals for everyone! The villa is an excellent service-provider with a kind and dedicated team of people looking after all your needs and requirements. If you wish, kayaks and paddleboards are available that you can take out to sea. Breakfast is included in your stay and for other meals, you can make requests, however, it comes at an additional charge. 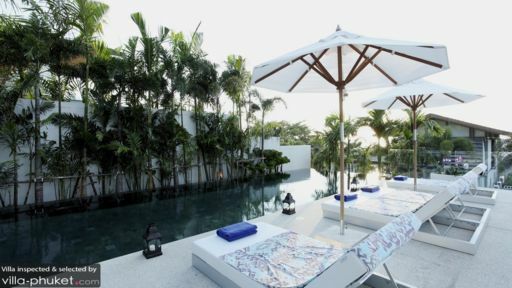 The villa is located in a quiet corner of Phuket, stone’s throw from Natai beach, which is a laidback and restful spot for relaxation as you won’t be disturbed by others. Sunbathe or indulge in watersports while you are there for a fun-filled day out on the beach!